Side View: 2 mo's old. 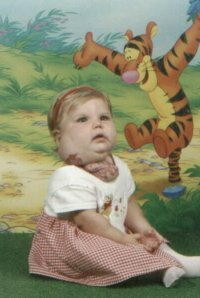 At this point the parotid hemangioma was growing quicker than the one on her neck. 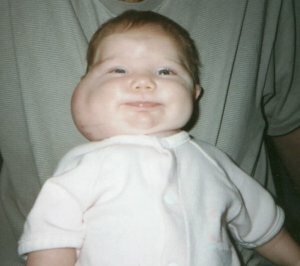 Frontal view of her parotid hemangioma- 2 months. At 14 mo's, both hemangiomas starting to involute. Softer, sagging. 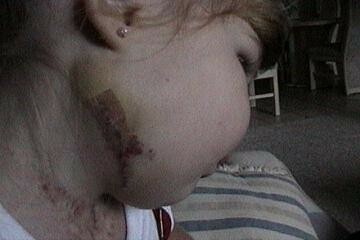 Danielle after surgery to remove the hemangioma on her neck. This picture was taken only 5 days after, stitches and swelling are still there, but doesn't she look fantastic! About 1 inch of the strawberry component remain, but should fade in time. 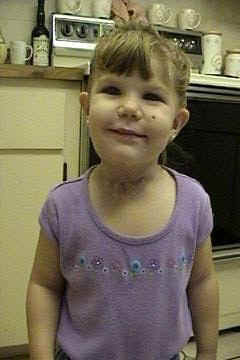 I'm told that laser can be performed but were just thrilled that Danielle has a neck for the first time in her life!!!!! Praise God! Here Dani is now 2 yrs old, and isn't she beautiful! (Even with a frosting mustache!!! 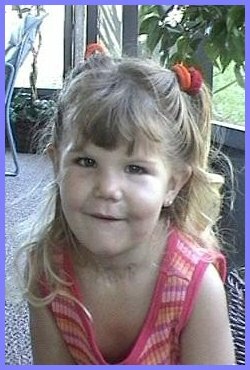 lol) As you can see, their is only a small amount of strawberry red at her neck now, and the parotid hemangioma on the right side of her face is almost completely gone, except of the red area....She's due for surgery at 2 1/2 yrs old to correct the stretched out skin on her face. 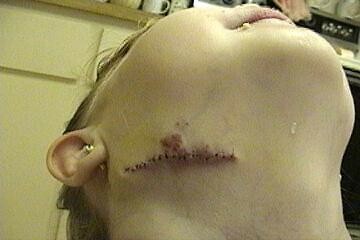 The surgi strips have fallen off and a good picture of the stitches. I included this shot because it shows how terrific her jawline looks now without the lump on the right side. It also shows the residual strawberry remaining on her neck, which fades more and more everyday. We'll decide when she's 5 if more laser surgery is needed . This was taken a month after her final surgery. Well, we made it! 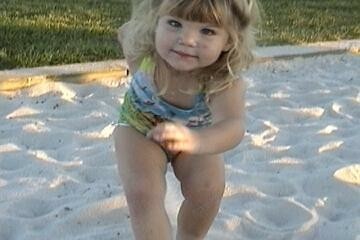 Danielle is almost 3 yrs old here. I wanted to post this pic cuz it really shows what's left after the surgeries and steroids. 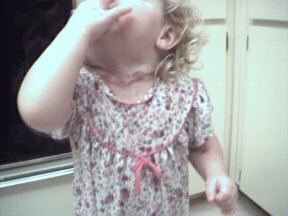 You can see where some scarring has occured on her neck, mostly from when the hemangioma ulcerated and laser needed to be done, but each month I notice the strawberry left is getting lighter and lighter. 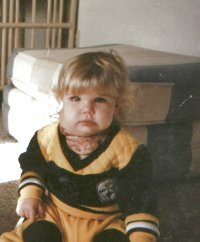 Danielle is now hemangioma free for the first time in her life!!! Praise the Lord, He sustained us thru it all, especially our precious Dani !